Aviators have always been innovative, passionate, and adventurous, and these early pioneers of flight were no exception. Here’s our list of five aircraft that transformed the future of flight. The 1905 Wright Flyer: Though the 1903 Flyer received all of the historical accolades, it was the 1905 Wright Flyer that was the world’s first truly practical aircraft. The Wright Brothers were able to teach others to fly using this aircraft, and took it touring throughout the world. This was the prototype on which all future airplanes were built. Blériot XI: The French have always been passionate and enthusiastic aviation innovators. At the turn of the century, they eagerly embraced the advances the Wright Brothers made in powered flight. Designed by Louis Blériot, the Blériot XI was the first airplane to fly the English Channel on July 25th, 1909. This model, with the engine in front and tail-dragger landing gear, would become the template for the first military aircraft to fly in combat. The Baumer Sausewind: The Sausewind or “Rushing Wind” was flown by Paul Baumer, a former dental assistant who competed in a 1925 aircraft race with this streamlined version of a propeller-driven aircraft. Designed by Walter Gunter, the aircraft had a wood elliptical wing jointed to the fuselage. The Sausewind’s shape was used as the basis for the Heinkel He 70 Blitz, which itself became the model on which the famous Spitfire’s performance would be judged. Douglas DC-1: Designed by a scientific team led by Arthur E. Raymond, this aircraft took the best research and experience the industry had to offer at the time and put it into one aircraft. 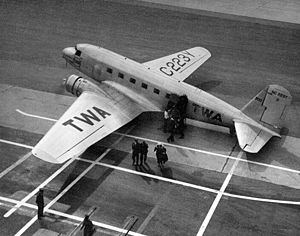 Built in 1930 to carry just twelve passengers, the twin-engine DC-1 was made of aluminum alloys, had retractable landing gear, and pitched propellers that could be controlled from the air. Though only one was ever produced, the DC-1 heralded the start of the DC generation of aircraft, including the DC-2 and DC-3, which would later inspire the Boeing 707. Bell XS-1: Chuck Yeager took this aircraft on its most famous flight in 1947, when it broke the sound barrier. The Bell XS-1 was the world’s first supersonic aircraft, designed with a bullet-shaped body and horizontal stabilizer that gave the operator more control at higher speeds. This was the aircraft that proved supersonic flight was possible, and led the way to the construction of aircraft that could fly to the very peak of the atmosphere.